FIL called me today and is asking my opinion. Next year he is taking all of us on another cruise, and yes, we are probably taking another one the next year for Ariel's graduation. Brat brat brat, I know, that's 3 years in a row. The one next year is on him though, unless we want to upgrade to a nicer cabin. So these are my choices, NCL Spirit(which I think is a a beautiful ship, with great architecture, and the Carnival Triumph, which looks lovely, but nothin' special, and not gawdy as opposed to a lot of Carnival ships. Kids are not going It will be my mil/fil, and my dh/me, with all of his siblings and their spouses, 11 or 12 of us. When we were on the NCL Star with our kids we really liked Freestyle dining, less rush, you show up for dinner/meals when you want. But there can be a bit of a wait or you may be asked to go to another dining room if it's full/too long of a wait. I missed the personal touches you get with other ships with set dining times and the same wait staff all week long. They know to bring you ice water and not to even bother with the wine list. And you also don't have assigned dining times with people you may/may not like. We'd be seated with the inlaws, which could drive me buggy before we even sit down. NCL we wouldn't have to sit with the family ;). 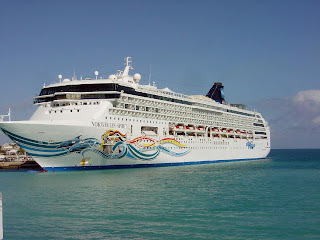 It looks like the Spirit is a beautiful ship and I was drooling over it when we were looking at NCL a long time ago. It also leaves out of New Orleans. Triumph leaves out of Miami. Some of the ports will be repeats, but anything in the Carribean is worth repeating :). 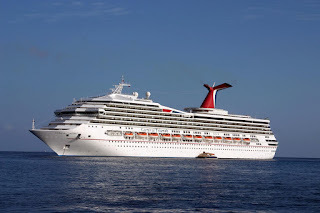 Spirit includes Costa Maya, Santa Thomas Castilla, **Belize, and **Cozumel.